Despite fine performances and period production, Hyde Park on Hudson is hobbled as a whole by poor focus and inconsistent tone and characterization. Not a disaster, but certainly a disappointment. Roger Michell’s Hyde Park on Hudson is a peculiar little historical film, beautifully performed and produced but with no clear sense of tone, perspective, or thematic focus. Certain individual moments work quite well, and interesting ideas or interpretations are presented every so often, but the film is not a cohesive success. Indeed, Hyde Park on Hudson mostly feels like two very different films awkwardly spliced together. 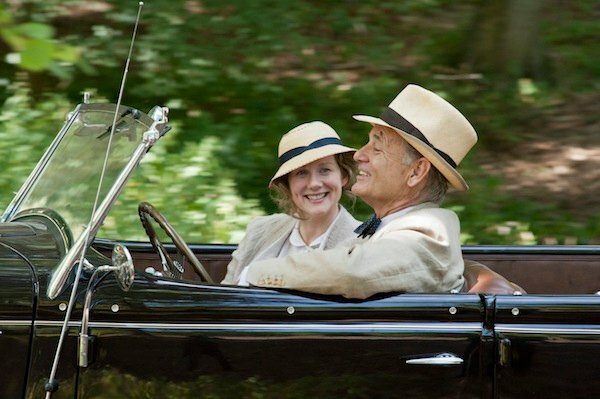 The first, a sort of Presidential soap opera involving Franklin Delano Roosevelt (Bill Murray) and purported mistress Margaret “Daisy” Suckley (Laura Linney), is largely flaccid and uninvolving, wildly inconsistent not only in how it views and presents the characters, but how the characters view and judge each other. The second, in which President Roosevelt hosts King George VI (Samuel West) and Queen Elizabeth (Olivia Colman) at his country estate in Hyde Park, New York, is promising, if not fully realized, for the way it intimately explores the personalities and motivations of legendary historical figures. The latter topic could make for a perfectly fine film on its own, for this side of the story provides several memorable moments. The dynamic between President Roosevelt – older, more experienced, and more challenged due to his polio – and nervous, stuttering King George is an interesting one, and the characters share a fine chemistry here. The King has come to request assistance, knowing that World War II is upon the horizon, and that gives Roosevelt the power in their meetings. Yet the President does not abuse his position, and instead plays friendly, attempting to find common ground and, in so doing, bring two previously divergent nations closer together. Any time the two characters share the screen, alone, the film is fascinating, and offers a unique and valuable perspective on history I am happy to have seen. Looking at the overall picture, though, one gets a much murkier sense of how the filmmakers view these characters and their place in history. This interpretation of King George is interesting when interacting with Roosevelt, but when alone with his wife, the film appears oddly antagonistic towards England. The King and Queen are often portrayed as shrill, dumbfounded, and utterly caricatured, so turned off by American customs that they cannot function properly, even around something as simple as a hot dog. I have no doubt that the first visit by British royalty to the United States was something of a culture shock, but certainly not the broad cartoon the film presents. Nor do I have any clear notion of how Michell and company view President Roosevelt. The political plot presents in him in one particular, if enigmatic way, but the romance plot with Daisy – a distant cousin, as we are constantly reminded – is practically incoherent in its view of the man. This is largely due to a failure in making the Daisy character compelling. Laura Linney is plenty good in the part, but on paper, Daisy is a blank state, free of personality or any distinguishing views or characteristics. She narrates long stretches of the film – usually unnecessarily – but we never get much sense of who she is, nor why she reacts to events the way she does. This cripples the dramatic handling of her relationship with Roosevelt – never historically confirmed as sexual, for the record – for as she goes back and forth on whether or not she is fond of the man, we are given varying evidence and perspectives, much of it mutually exclusive. If he is a foolhardy and duplicitous philanderer who would rather focus on women than work, then he certainly cannot be the political genius we see interacting with King George (nor, I wager, a President capable of leaving such a large mark on history). I do not inherently reject any interpretation of the man if it can be well presented and substantiated, but the romantic material – often the focal point of the movie – is severely underdeveloped, and drags the political content down with it. 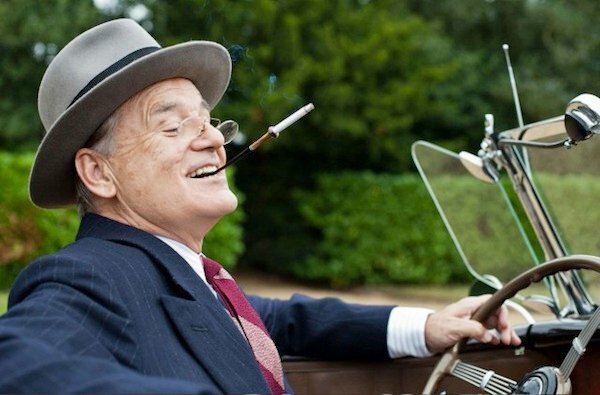 This is a shame, especially considering how fantastic Bill Murray is as Roosevelt. I would almost recommend the film on strength of his performance alone, for in the casual and nuanced way Murray inhabits the President, one gleans volumes about how this man moved through the world. If gifted with better writing and greater focus, Murray could very well create a definitive cinematic portrait of the man, and it is too bad Hyde Park on Hudson does not offer him that chance. It is similarly depressing to see such lush cinematography and gorgeous production design go to waste on a rather limp story. This is a beautifully made film, and I suspect this exact cast and crew, working off an improved script, could probably produce something of great value. As it stands, Hyde Park on Hudson is hobbled as a whole by poor focus and inconsistent tone and characterization. This is not a disaster by any means, but given the talent involved, it is certainly a disappointment.